Packed with flavor and super versatile, this quick and easy dish will change your breakfast, lunch and dinner life forever. Ok so I realise that some of you may not know of or ever heard of or maybe never tasted savoury mince before. But that’s ok…that’s what the internet and food blogs are for, right? To teach and educate each each other, so that we can enjoy all the flavors and dishes of the world. What a great time that we live in. And today I am not only going to show you the traditional way of eating this delicious dish but I am going to show you how to use this Savoury Mince Three Ways. So what is savoury mince? 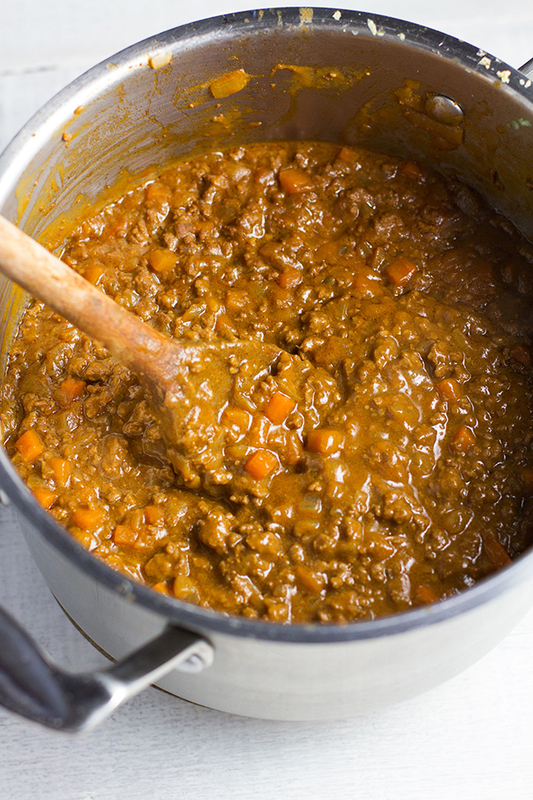 Well it is ground beef or mince meat as we call it, that is cooked up with diced onion, carrot and garlic then flavored with mustard, soy sauce and Worcestershire sauce. 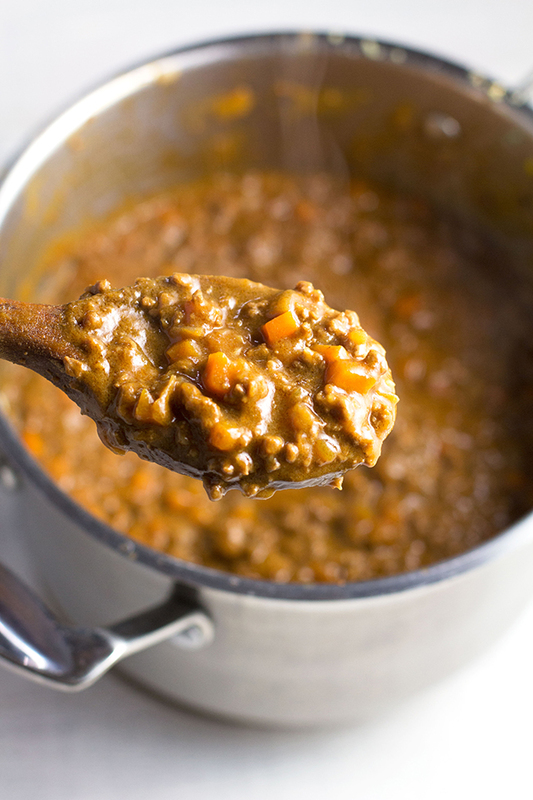 A roux is added to give the dish a thick almost creamy texture. It is typically served for breakfast. Piled upon toast and usually with a perfectly poached egg perched on top. It is a pretty old school dish but it is super tasty and one of Jason’s favs, which is why I am sharing his recipe with you today. The first time I realised Jason’s great love for this dish was on a holiday on the Gold Coast in Australia, which was almost 9 years ago now. Gosh time goes by fast. We were staying in a hotel just near Broadbeach, so every morning we would leisurely walk down to one of the cafes for breakfast. The first morning after studying the menu closely he chose, you guessed it, the savoury mince. He once again chose this the next morning. Then the next. And then the next. By the fifth day, and after I had eaten an array of items off the menu including French toast, breakfast burritos and baked eggs, I decided to give his trusty savoury mince a go. After the first bite I could totally see why he had been eating this everyday. It was damn amazing. Packed with flavor, leaning towards the salty side, with a rich creaminess to the texture. I just couldn’t get enough. From that day until the end of the trip we both ordered the savoury mince every morning. I swear the staff must of thought we were slightly crazy. And from the day that we returned home this addictive dish has been popping up in our kitchen on a regular basis. But I don’t believe that this dish was destined to only live its life out on a piece of toast. So I got Jason to make up a batch of his savoury mince and thought I would share with you my three favourite ways to eat it. 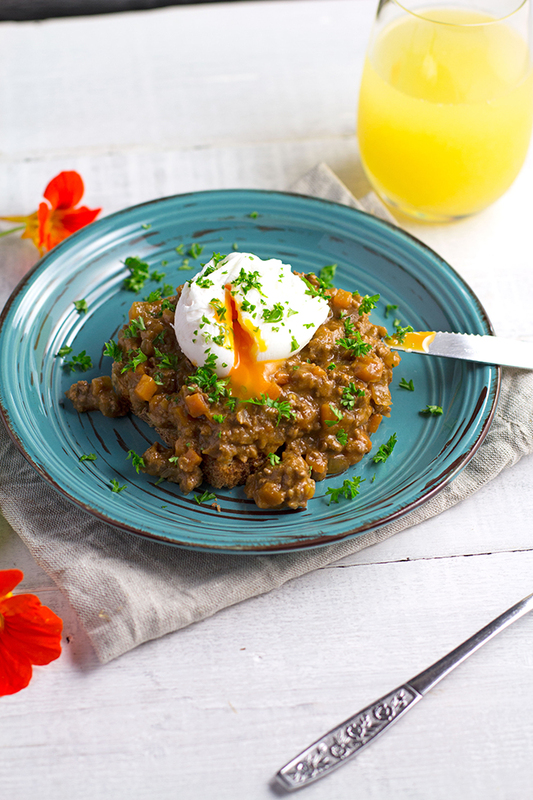 First up we have got the traditional breakfast version where you simply top a piece of toast, or maybe even a bagel, with a good dollop of savoury mince and then top it with a perfectly poached free range egg. Up next is the loaded wedges lunch option. 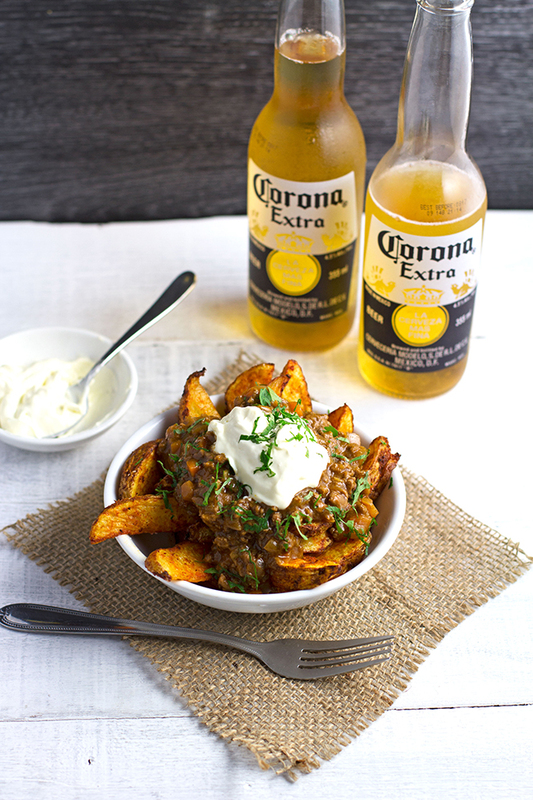 Simply cook up a batch of HOMEMADE SPICY WEDGES and top with savoury mince and sour cream. And finally the dinner option as a fantastic pasta topping. 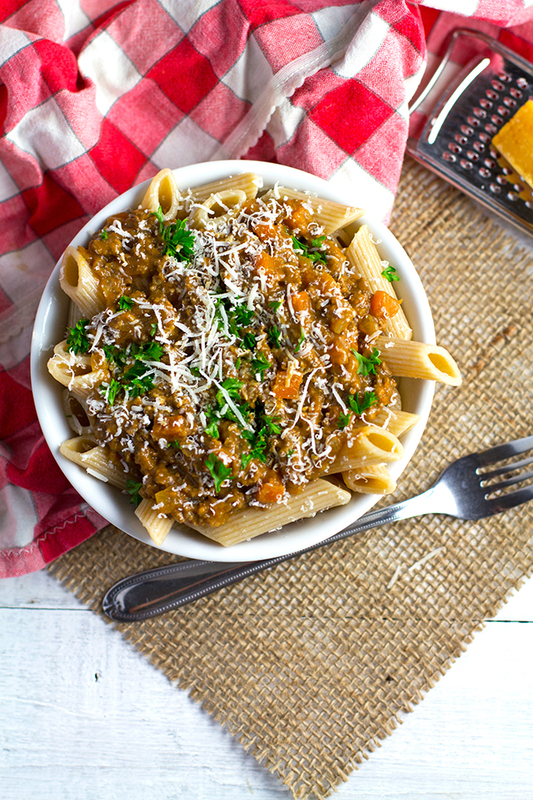 Just cook up your favourite pasta, I love and used wholemeal penne for this, then mix through the savoury mince and serve with a bit of shaved Parmesan. And if you guys try this and find a new way to enjoy it, then share the love by commenting below. I would love to try your ideas. In a large saucepan or pot heat the olive oil over a medium to high heat. Add the diced onion, carrot and crushed garlic. Sauté for a bout 5 minutes until the vegetables have started to soften. Add the ground beef/ beef mince and continue to cook whilst stirring until all the meat has been browned off. Add the Worcestershire sauce, mustard, soy sauce, stock and tomato paste. Give it a good stir and simmer over a medium heat for 15-20 minutes. Stirring occasionally. Melt the butter either in the microwave or on the stovetop, and stir in the flour to form a thick paste. Add to the beef mixture and stir well. Remove from heat and stir for a couple of minutes until the sauce has thickened up nicely. What to you mean by mild mustard ,is it the American type that we use with burgers.? A picture please. when you simmer for 15-20 minutes do you cover the saucepan or not ? Hi there, yes that’s right it’s the American type of mustard that is used on burgers etc. I simmer it with the saucepan uncovered. Thanks and I hope you enjoy it. This was such a great and easy recipe. The taste is divine, reminded me of a Pakistani curry recipe I tried once. I used a pork beef mix and it turned out great. Thanks for sharing! Thanks Kasi I am so glad that you liked it!! I will have to try it with the pork mince mix next time I make it. Oh my word! I made this and served it with the wedges and sour cream and it was a-maze-ing! This goes into regular rotation!